Last time, we got lots of requests for another 2 hour open-mic… we aim to please, so we’re doing it again. On Wednesday, April 3rd, join us for a great night with lots of singer-songwriter variety. Chances are you ‘ll have time to sing more than the usual allotted 2 original tunes! 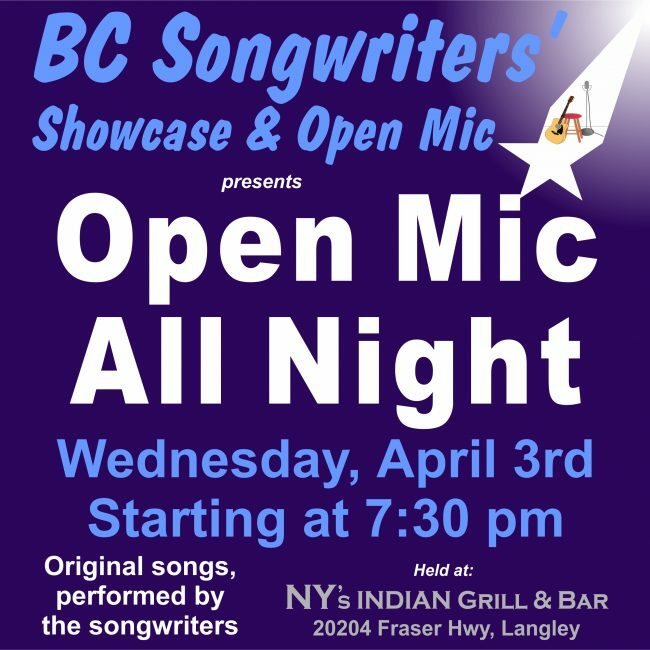 BC Songwriters hold our Songwriter Open Mic Nights at NY’s Indian Grill & Bistro… hope to see you there! On Wednesday, March 20th, BC Songwriters is having an “Open Mic All Night”, starting at 7:30 pm. It is “originals only”, so no covers, please! 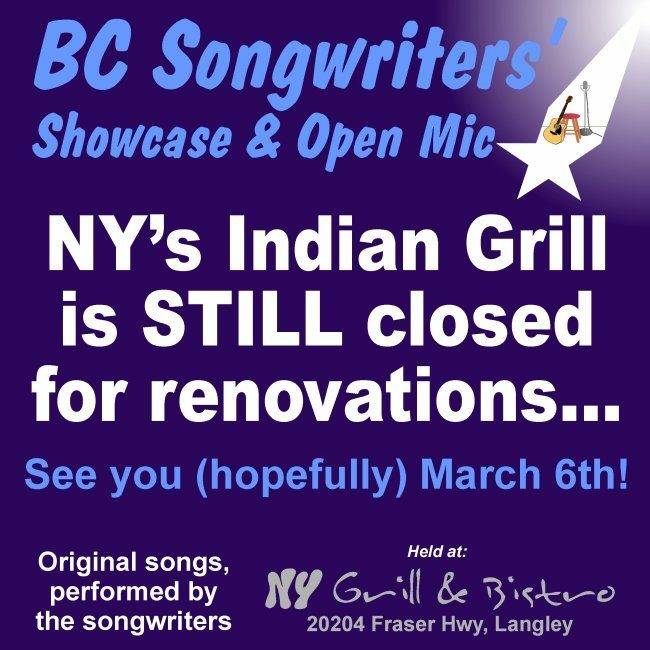 Sign up is on a first come, first on basis… and in-person only, and it all happens at NY’s Indian Grill & Bar – 20204 Fraser Hwy, in Langley. 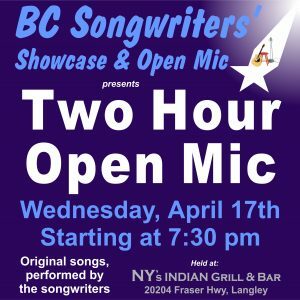 The new owners of the restaurant have now completed their renovations, so now we can resume BC Songwriter’s bi-weekly “originals only” Songwriter Showcases. Join us to help celebrate the Grand Opening week of NY’s INDIAN GRILL & BAR! It is located at 20204 Fraser Hwy, in the heart of Langley. 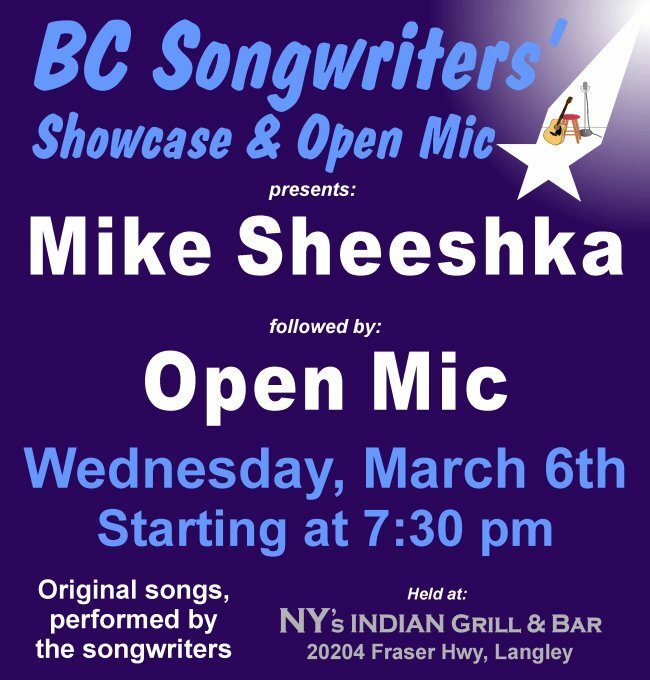 We’ll start at 7:30 pm on Wednesday, March 6th, and continue until 9:30pm..
Mike Sheeshka is our featured Showcase performer. He’s a multi-talented musician with some very catchy original tunes. Don’t miss him, come early. 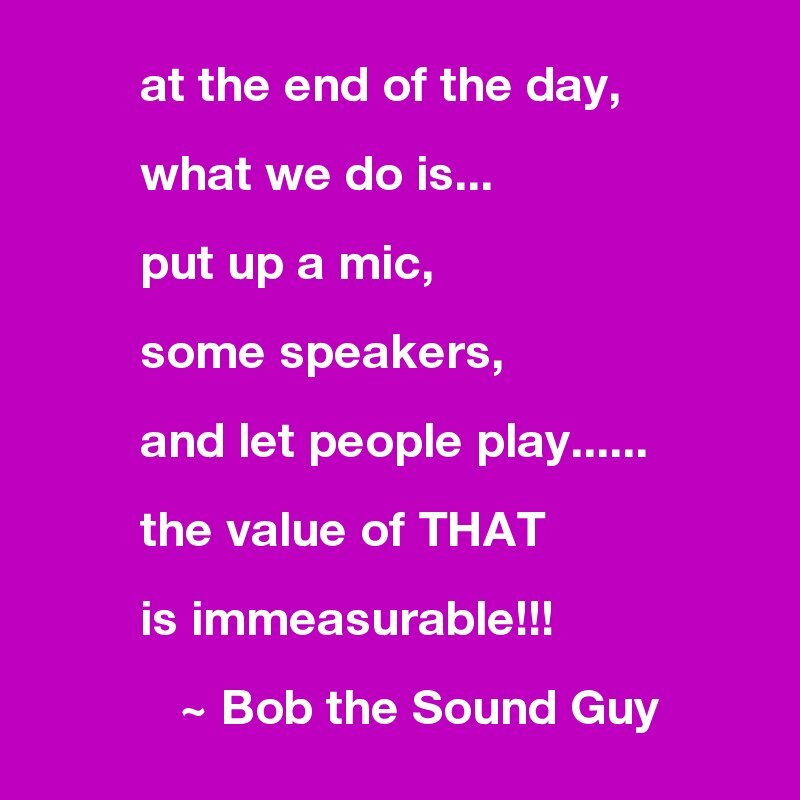 For those wanting to perform at the Open Mic… it is “in person” only sign up, on a first-come, first-on-stage, basis! Looking forward to a very fun night… we hope to see you there! Hopefully see you all on Wednesday, March 6th!